Which type of cement to use ? The strength of a group! Ciment Québec inc. is an integrated cement group that includes several divisions in the cement, concrete and aggregate sectors. Our cements are derived from the Synergia™ process, a unique ecoperforming cement production process in North America. Ciment Quebec Inc. produces a broad range of cement products : the ELEMENT™ Portland cement products and the EVOLUTION™ masonry cement products. 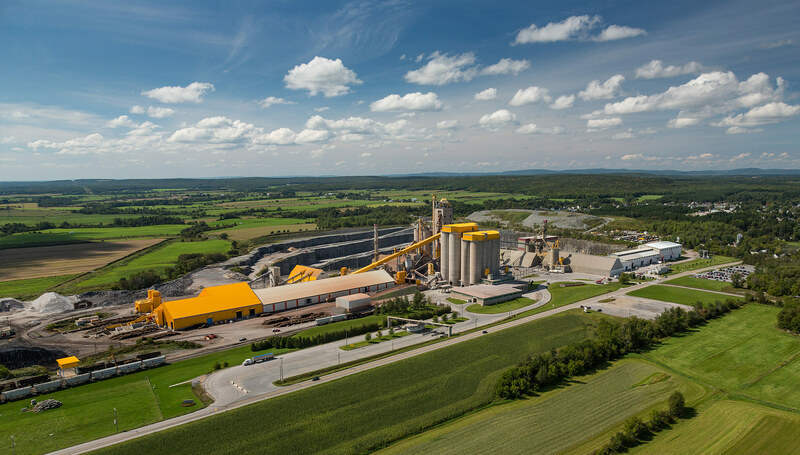 Ciment Québec Inc. (CQI) is an integrated cement producer with divisions in cement, ready-mix concrete and aggregates. CQI has one of the most modern cement plants in North America. CQI and its numerous divisions are active in Quebec, Ontario, the Maritimes Provinces and the United States. The staff includes more than 700 experienced and skilled people who work on a daily basis to produce the highest quality products and provide the best service there is to its clients, confirming and reinforcing the commitment to excellence of CQI. Ciment Quebec Inc. and many of its divisions in Canada and the United States, more particularly in the provinces of Quebec, the Maritimes and Ontario as well as in the states of Vermont, New Hampshire, Massachusetts, Maine and Rhode Island. Ciment Quebec Inc. (CQI) is an integrated cement producer with divisions in cement, ready-mix concrete and aggregates. CQI has one of the most modern cement plants in North America. CQI and its numerous divisions are active in Quebec, Ontario, the Maritimes provinces and the United States. The staff includes more than 700 experienced and skilled people work on a daily basis to produce the highest quality products and provide the best service there is to its clients, confirming and reinforcing the commitment to excellence of CQI. The quality of our products depends on the quality of our employees. Ciment Quebec Inc. offers a stimulating work environment, where team spirit is highly developed and the quest to excellence is encouraged : personal, technological, technical, operational, organizational, environmental, etc. You like putting your shoulders to the wheel and you have a desire to excel? You wish to make a career within a first-rate dynamic team? Ciment Quebec Inc. is hiring people like you. Calculate the amount of concrete required for your project.